I try to do nice things for others. I throw some money in the Ronald McDonald house box when we do drive thru (aka- 200 times a week), make canned donations and donate regularly to resale shops in our area. I am trying to teach my kids that giving to others will not only help people that need it, but it will bring joy in their own lives to know that they’ve made a difference. That said, I will never donate another stuffed animal as long as I live. My daughter is a hoarder of anything filled with cotton or those tiny plastic beads that will most definitely cause cancer if consumed. She has 42 stuffed animals in her bed right now, and they are ALL special. They all have names, unique personalities and she WILL notice when one is missing. Several months ago I decided it was time to deep clean her room. I knew what I was getting into but the amount of stuffed animals, books and tiny toy pieces stuffed under that girl’s bed was out of control. How does she even know what is under there?! I laid everything out for her and told her we were going to start a “keep”, “store” and “donate” pile. I explained VERY thoroughly what each of those categories meant. I’ve seen Hoarders. I know how important it is to cut the cord on the attachment of “things” at an early age. I told her to be like Elsa- conceal it, don’t feel it, don’t let it show. Just let them GO. We started with the stuffed animals and somehow 90% of them ended up in the keep pile. One of the first things to end up in the donate pile, with out even a blink of her eyes was a purple striped sock monkey. Her exact words were “I don’t like him, he can go play with someone else”. After a lot of convincing using tactics I learned from the counselors on TV, we had manageable sized keep, store and donate piles. Success!!! I packed up the donate items to put in our basement for a few months, juuuuuust in case she had a change of heart on something. I thought I was being SO smart. A few weeks ago I dropped off that large load of goods to a local resale shop. It felt great to get that stuff out of my basement and into the hands of someone that could use it. In one of the boxes, stuffed way down at the bottom, was a certain purple striped sock monkey that I was certain would not be missed. Last week, right before bedtime, I spent 2 hours comforting my sobbing 4 year old daughter because she couldn’t find her “soft monkey”. I could NOT figure out which of the 42 “keep” pile animals she was talking about. 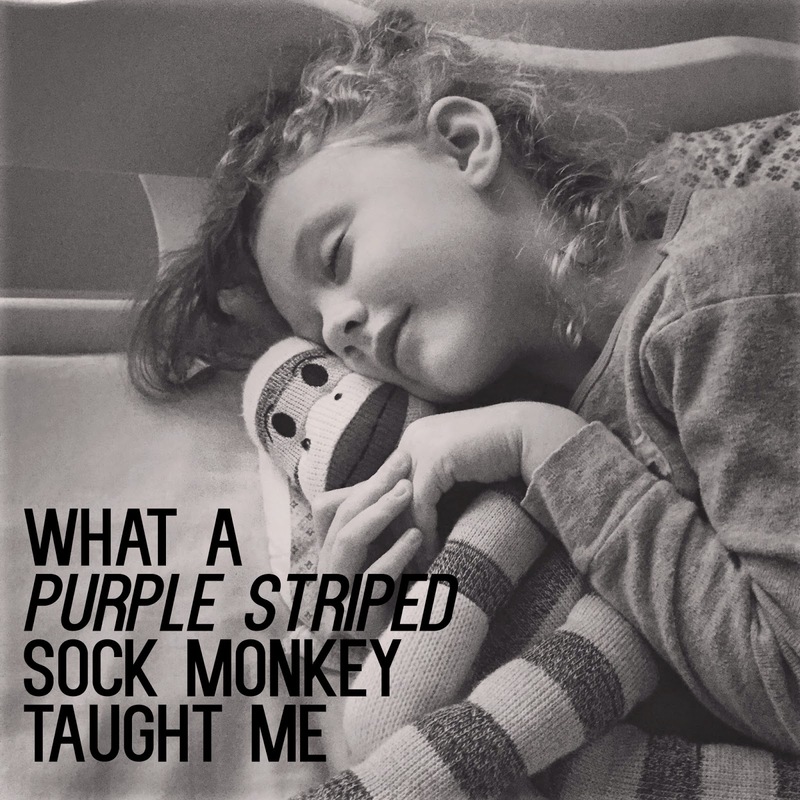 Then I finally realized it was the purple striped SOCK monkey that I donated. I told her that he was probably misplaced and we could look for him later. I prayed that she’d just forget about it but guess who she wanted to sleep with the following night? Guess who was crying for over an hour…SOBBING because she “missed that soft monkey and loved him times a million”. I’ve never seen that girl even touch that freaking monkey. And there I was scouring the internet trying to find an exact replica of THE purple striped sock monkey. I couldn’t find it. Then I checked eBay. Apparently this is where toys go to die. I FINALLY found one that wasn’t $400 and it even came with a blue stripped buddy. I gladly paid the $30 including shipping so that I wouldn’t have to deal with the uncontrollable sobbing of a child that has lost her best friend…that she only realized she loved when he was gone. I don’t sugar coat much or lie to my kids. When it is time to get a shot, I don’t tell them it won’t hurt. My daughter knows what a chicken nugget is. She knows that the spider is a goner at end of Charlotte’s Web. She’s learned the hard way that if you eat enough pancakes you will throw up. I let my kids learn their own lessons. It’s a school of hard knocks over here. That said, I told her Santa has her striped monkey. It wasn’t my finest parent moment but I couldn’t stand the constant sobbing and heartbreak over this thing. The monkey wanted a friend for her brother and thought it would be a great idea to ask Santa about him. So, naturally, he traveled to the North Pole to bring a buddy home. I told her that I sent Santa an email and he replied back with a picture (from the eBay listing) showing that her beloved purple sock monkey was just fine and would be returning home soon. I was tangled in a web of lies and she TOTALLY bought it. Reunited and it feels so good. She hasn’t let the monkey out of her site since he’s been home. I failed at providing a very valuable lesson. I should have told her that I donated him. That there was another child playing with the purple striped monkey. That the child might not have much but that her monkey was giving them so much joy. That he was probably their best friend and was being taken care of and loved. But I didn’t. Instead I’ll save the lesson for when she’s older and has children of her own. When she looks around her house, more specifically under her 4 year old’s bed, and decides enough is enough. When she places the unloved stuffed animals in a box to donate and smartly hides them away thinking she’ll get away with it. I will tell her- just keep them. Get rid of the toys, but don’t get rid of those stuffed animals. I also vow to purchase every one of my grandchildren NO LESS than 200 stuffed animals each. This will include the largest stuffed penguin I can find, at least 78 Beanie Babies and stuffed zoo gift shop animals that will need to have arms and legs sown on over and over again. And you better believe that both my daughter and son’s first born children will be receiving a certain purple or blue striped sock monkey because those two are in for life. But first I must wash them, who knows where those monkeys have been.